The popular saying is “next man up.” Football is a game of attrition; players inevitably get hurt over the course of a grueling season, and the team must be ready to replace them. Yet, starting B-back Dedrick Mills’s dismissal from the team a few weeks ago leaves a hole larger than any other player’s might. Tech was ready to count on Mills as a significant contributor in a year when the team debuts a new starting quarterback. Deadspin projected Mills as “one of the conference’s premier running backs” in its season preview of the Jackets. Indeed, his 12 rushing touchdowns as a true freshman were a truly impressive contribution for a player just learning the ropes against ACC defenses. With Mills transferring to Garden City Community College in Kansas, a program that produced former NFL running back Corey Dillon, Tech coaches can no longer entertain visions of Mills trucking over hapless defenders en route to an ACC Champion-ship berth. Attention must now turn to who will shoulder the load left behind by Mills. The easy answer is redshirt sophomore KirVonte Benson, who was promoted to starter in anticipation of the season opener against Tennessee. Benson brings a different aspect to the offensive backfield than Mills; he is about 15 pounds lighter and as a former high school track star, likely quicker, a key quality with A-back Clinton Lynch banged up. There is also the question of Benson’s fit into a chemistry-based offense. Successful execution of the option requires a quarterback to not only trust his blockers but also the A-backs and B-backs. Without an extended period of time to build a rapport with Benson, it would not be surprising to see early offensive foibles during the season opener. 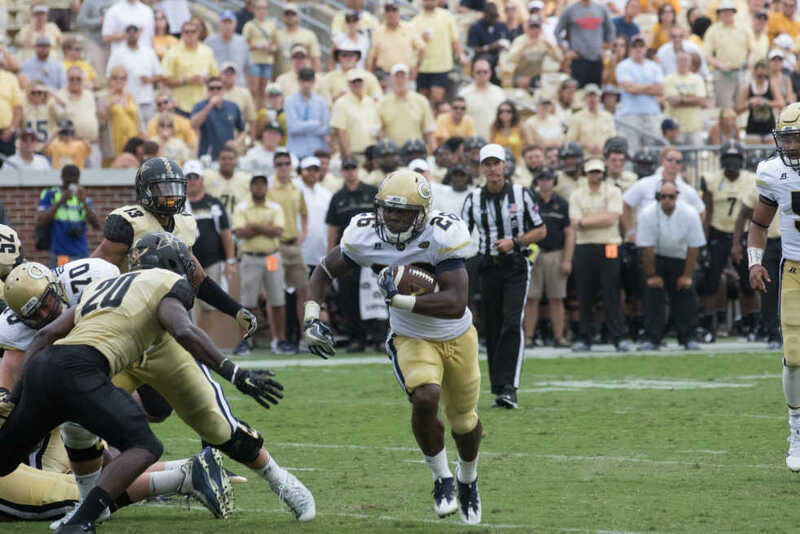 Fortunately for the Jackets, much of the offense remains untouched from last year — the offensive line and receiving corps return intact, save for dependable center Freddie Burden. While quarterback and potential starter Matthew Jordan looked shaky as a passer during his start against Virginia Tech last season, the only extended action of his Tech career so far, he will likely be more potent on that front after a full offseason to work with receivers Ricky Jeune and Brad Stewart. The same can be expected for left tackle Jahaziel Lee and left guard Parker Braun; both played well in their freshman campaigns but have a golden opportunity to demonstrate meaningful improvement. Of course, it is entirely possible that Jordan will not take the first snap under center for Tech on Monday night. While he is the most senior member of the quarterback room and acquitted himself well last season, the Jackets have yet to name a starter, placing Jordan along junior TaQuon Marshall and redshirt freshmen Lucas Johnson and Jay Jones. Regardless, it will likely take a few weeks for real stability in the Tech offensive huddle. Somewhat ironically, the player who might be most affected by this recent turn of events no longer plays for the Jackets. Junior B-back Marcus Marshall transferred to James Madison over concerns that he would not receive playing time. That was an understandable worry with the ascendance of Mills, but if not for that decision, Marshall may well have started his season in the starting lineup at Tech. It is worthwhile to remember that Mills’ ascendance as an excellent running back was almost as surprising as his dismissal. It is entirely possible that Benson impresses and the void of offensive production left behind by his predecessor is filled. Yet no team can count on such an improbable rise. Paul Johnson mentioned that in Mills’ absence, he “expect[s] the other guy to have a great year, whether it’s KirVonte (Benson) or Quaide (Weimerskirch) or Jerry (Howard) or (Jordan Ponchez-Mason) or whoever it is,” courtesy of AJC.com. Whether his expectations are grounded in reality will soon be clear.